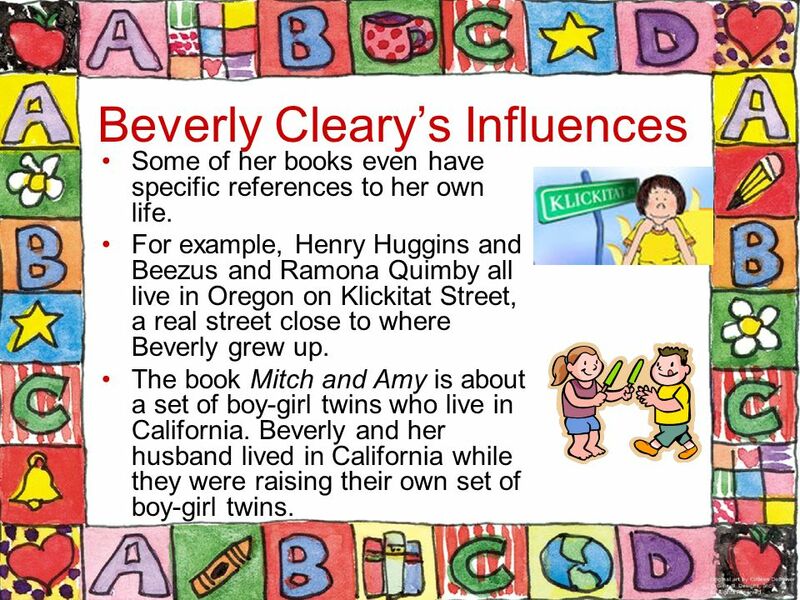 All About Beverly Cleary. 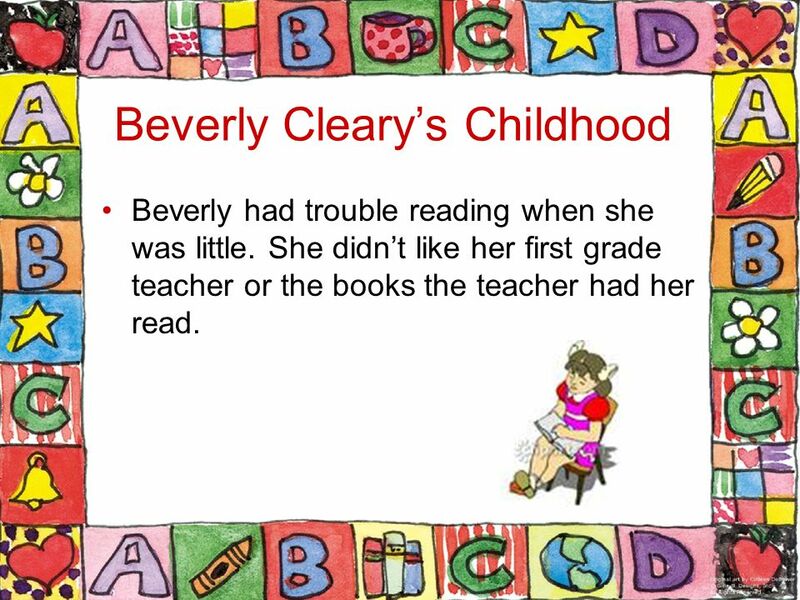 Beverly Cleary’s Childhood Beverly Cleary was born on April 12, 1916 in McMinnville, Oregon. McMinnville was so small that it. 2 Beverly Cleary’s Childhood Beverly Cleary was born on April 12, 1916 in McMinnville, Oregon. McMinnville was so small that it had no library. So Beverly’s mother borrowed books from the state library and set up her own library. This was where Beverly began to love books. 3 Beverly Cleary’s Childhood Beverly had trouble reading when she was little. She didn’t like her first grade teacher or the books the teacher had her read. 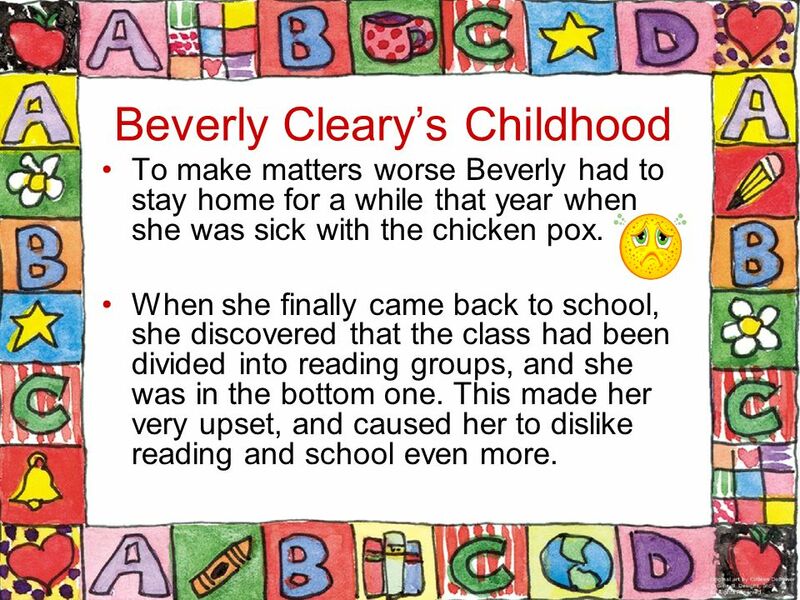 4 Beverly Cleary’s Childhood To make matters worse Beverly had to stay home for a while that year when she was sick with the chicken pox. When she finally came back to school, she discovered that the class had been divided into reading groups, and she was in the bottom one. This made her very upset, and caused her to dislike reading and school even more. 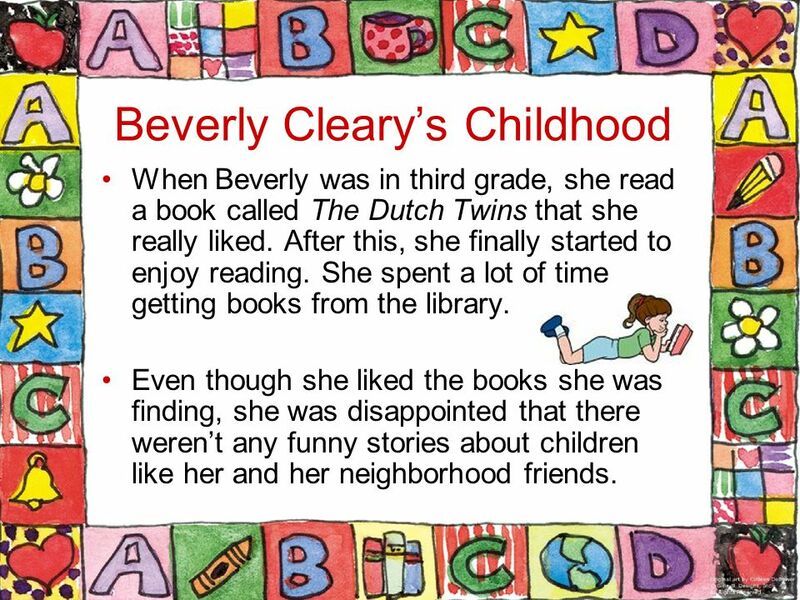 5 Beverly Cleary’s Childhood When Beverly was in third grade, she read a book called The Dutch Twins that she really liked. After this, she finally started to enjoy reading. She spent a lot of time getting books from the library. Even though she liked the books she was finding, she was disappointed that there weren’t any funny stories about children like her and her neighborhood friends. 6 Beverly Cleary’s Childhood When she was in seventh grade, the librarian at Beverly’s school suggested that she write children’s books when she grew up. Beverly liked this idea a lot. She wanted to write the kinds of books she couldn’t find in her library. 7 Beverly Cleary’s Adult Life Beverly Cleary moved to California when she was 19 to go to college. She went to library school and received a degree in librarianship in 1939. Her first librarian job was in Yakima, Washington. Having story hours for children was her favorite part of her job. 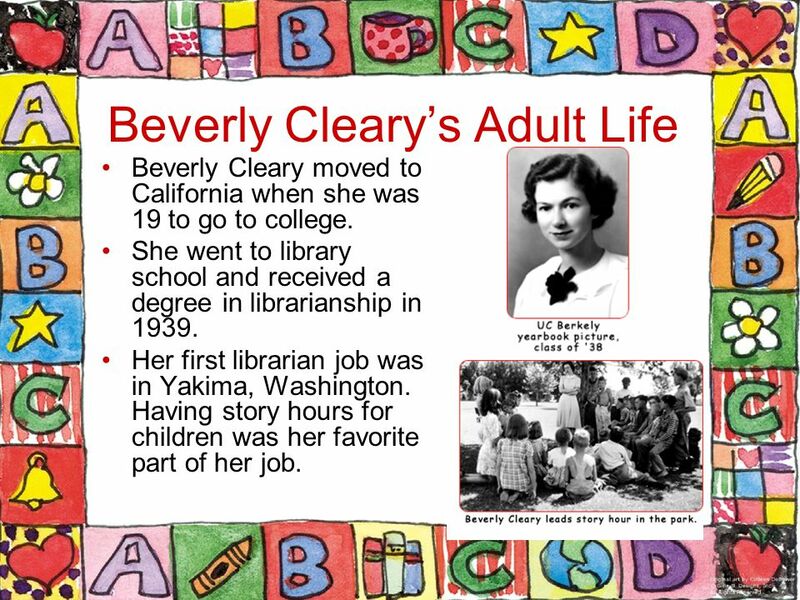 8 Beverly Cleary’s Adult Life Many of the children she met at the library wanted to read books about kids like themselves, just like she did when she was young. Their requests inspired her to write her first book. It was about a boy named Henry and his dog Ribsy. The book was called Henry Huggins. It was published in 1950. 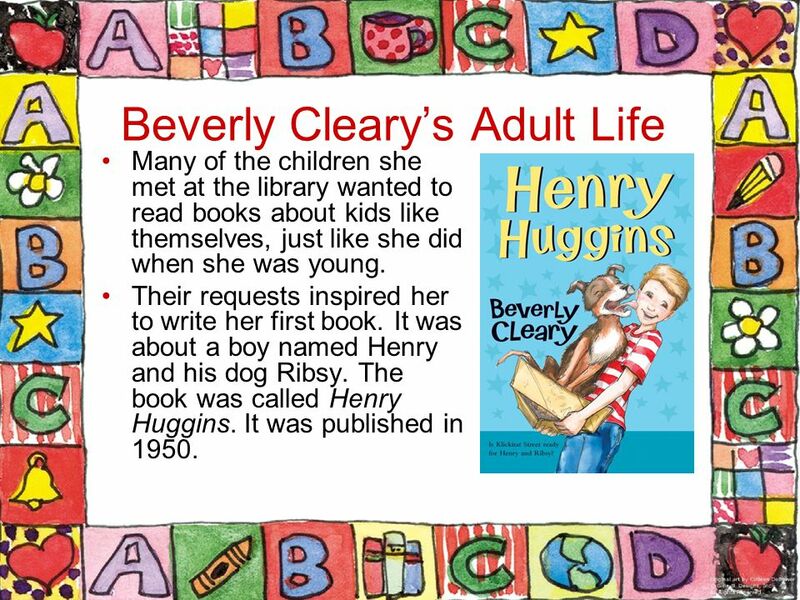 9 Beverly Cleary’s Adult Life Beverly married her husband, Clarence T. Cleary, in 1940. He died in 2004, but she is still alive! After the success of Henry Huggins, she continued writing the kinds of books she had wanted to read when she was little. Her first book about the Quimby sisters, Beezus and Ramona, was published in 1955. 15 Beverly Cleary’s Books In addition to all her books for children, Beverly Cleary wrote two autobiographies, or books about her own life. They are called A Girl From Yamhill and My Own Two Feet. 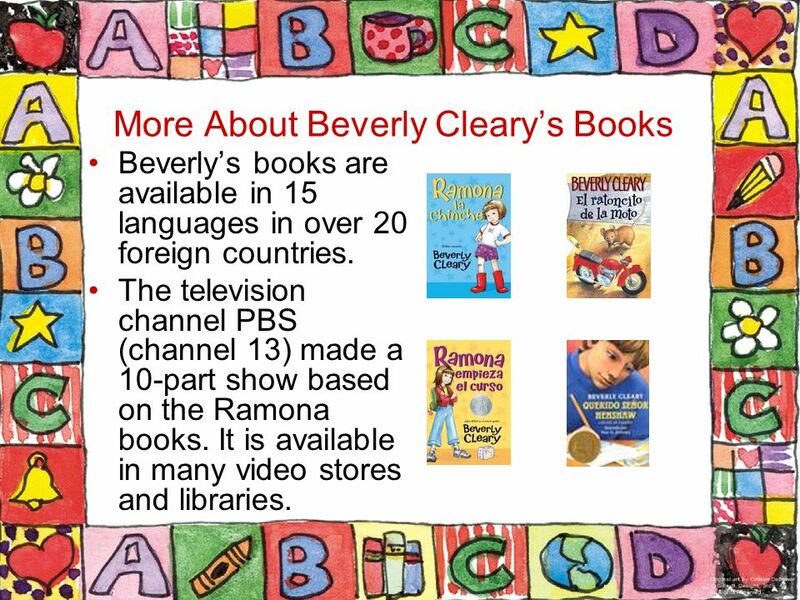 16 More About Beverly Cleary’s Books Beverly’s books are available in 15 languages in over 20 foreign countries. The television channel PBS (channel 13) made a 10-part show based on the Ramona books. It is available in many video stores and libraries. 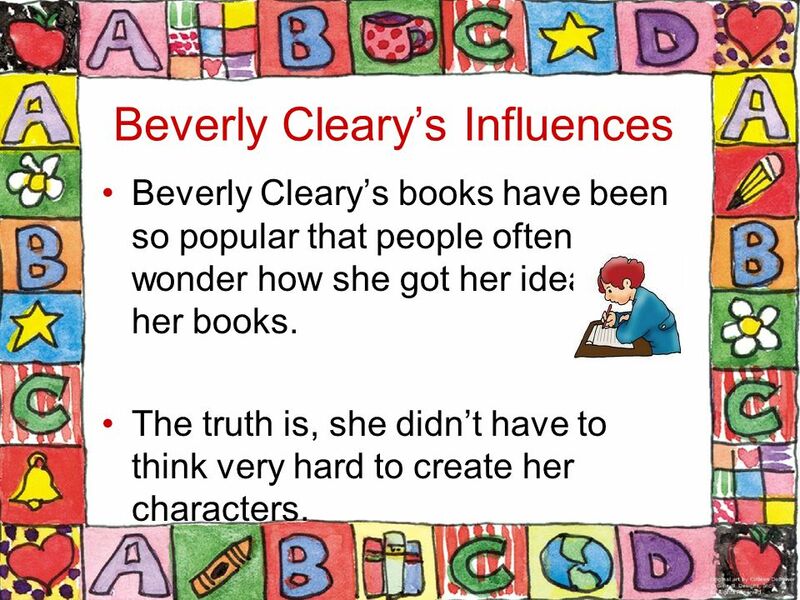 17 Beverly Cleary’s Influences Beverly Cleary’s books have been so popular that people often wonder how she got her ideas for her books. The truth is, she didn’t have to think very hard to create her characters. 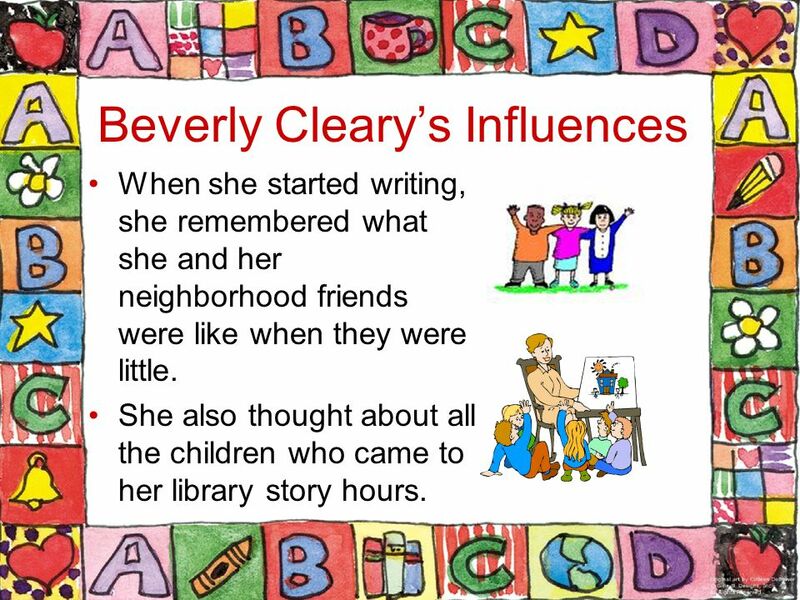 18 Beverly Cleary’s Influences When she started writing, she remembered what she and her neighborhood friends were like when they were little. She also thought about all the children who came to her library story hours. 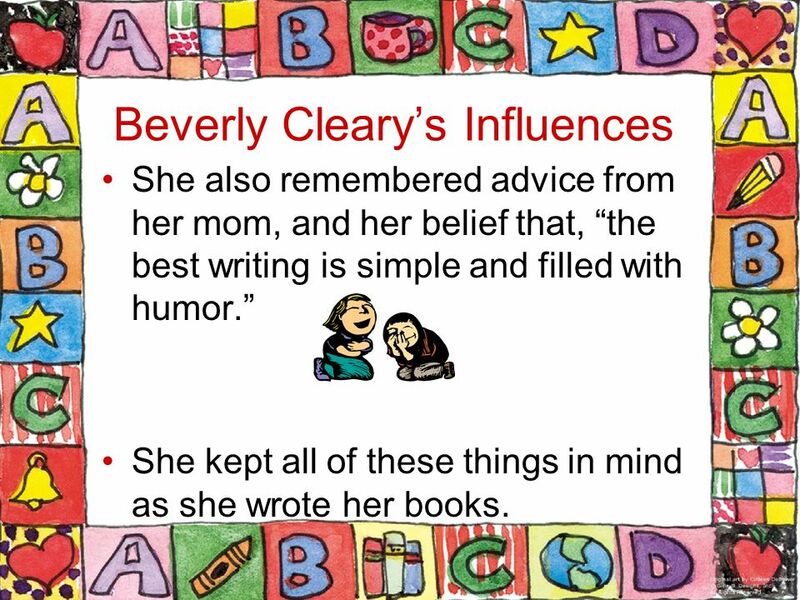 19 Beverly Cleary’s Influences She also remembered advice from her mom, and her belief that, “the best writing is simple and filled with humor.” She kept all of these things in mind as she wrote her books. 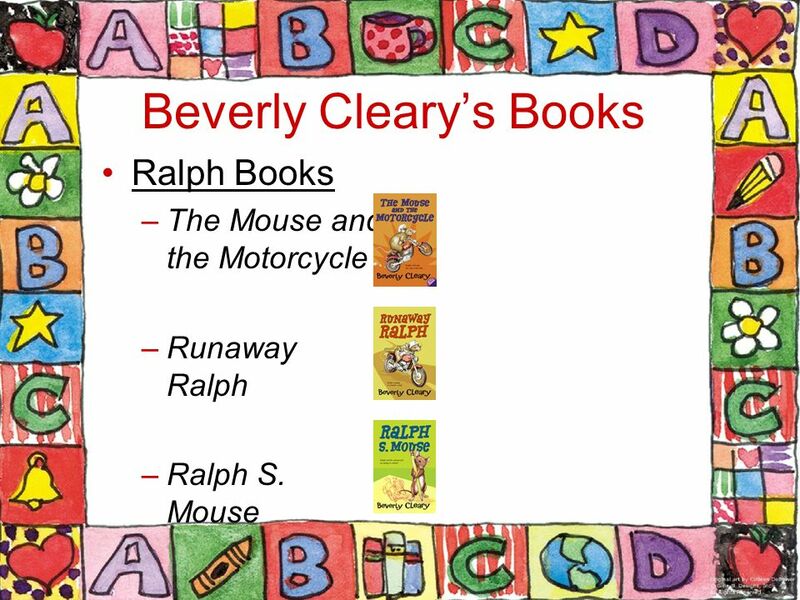 20 Beverly Cleary’s Influences Some of her books even have specific references to her own life. For example, Henry Huggins and Beezus and Ramona Quimby all live in Oregon on Klickitat Street, a real street close to where Beverly grew up. The book Mitch and Amy is about a set of boy-girl twins who live in California. Beverly and her husband lived in California while they were raising their own set of boy-girl twins. 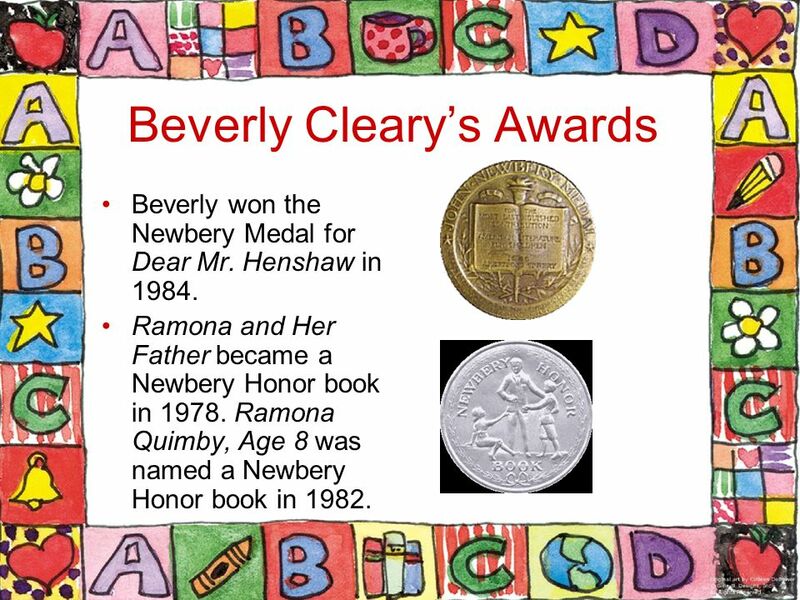 21 Beverly Cleary’s Awards Beverly won the Newbery Medal for Dear Mr. Henshaw in 1984. Ramona and Her Father became a Newbery Honor book in 1978. Ramona Quimby, Age 8 was named a Newbery Honor book in 1982. 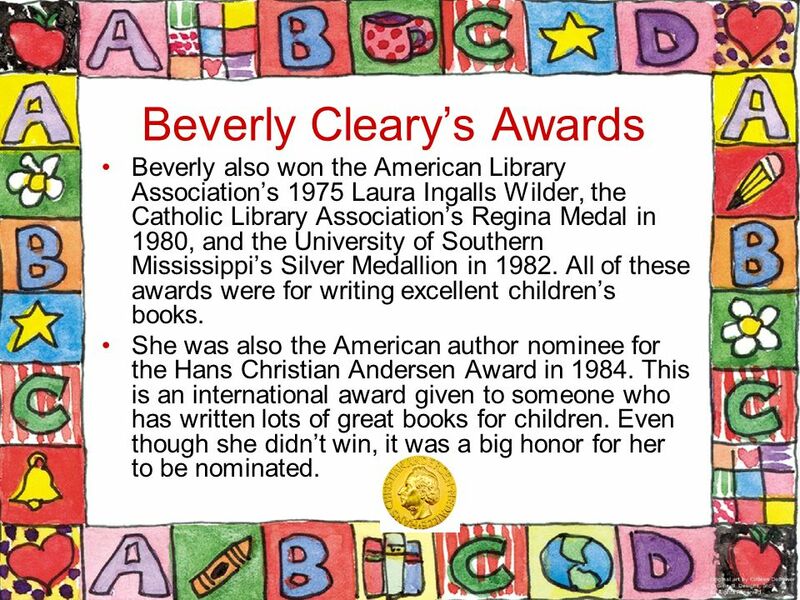 22 Beverly Cleary’s Awards Beverly also won the American Library Association’s 1975 Laura Ingalls Wilder, the Catholic Library Association’s Regina Medal in 1980, and the University of Southern Mississippi’s Silver Medallion in 1982. All of these awards were for writing excellent children’s books. She was also the American author nominee for the Hans Christian Andersen Award in 1984. This is an international award given to someone who has written lots of great books for children. Even though she didn’t win, it was a big honor for her to be nominated. 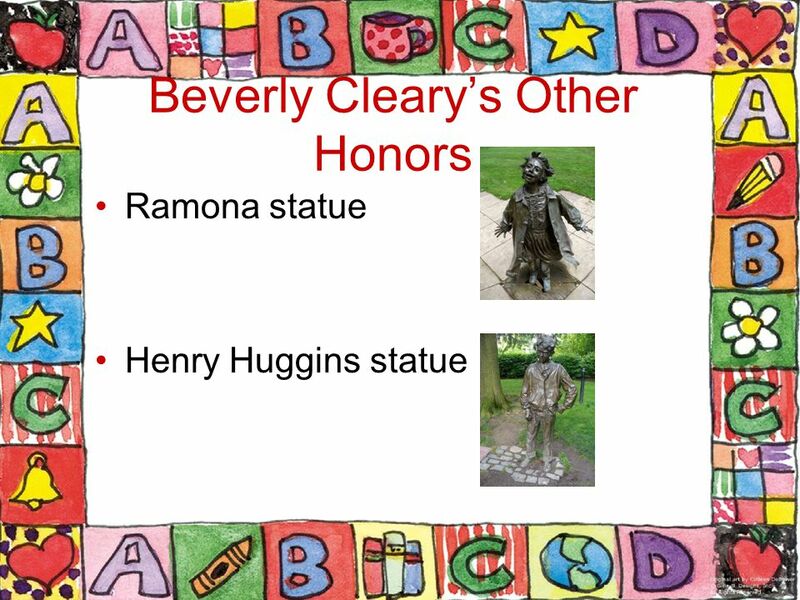 23 Beverly Cleary’s Other Honors Beverly has been honored in other ways too. 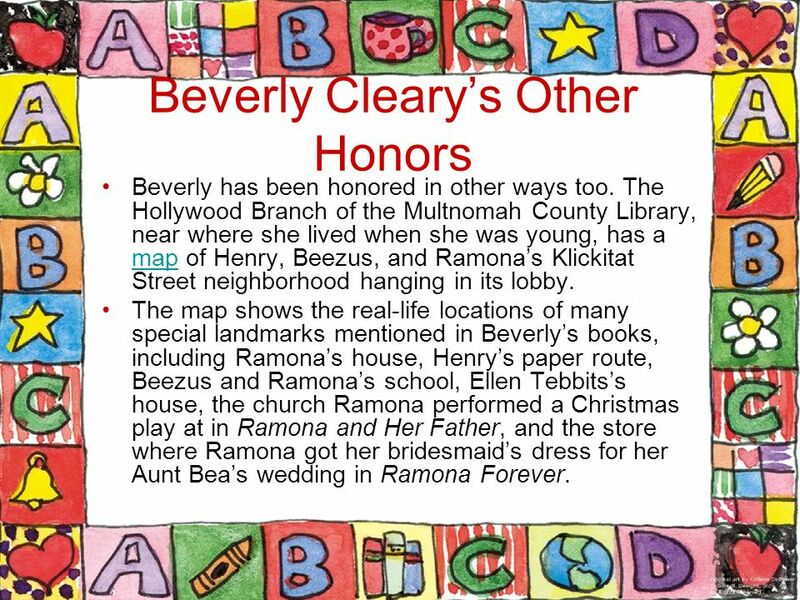 The Hollywood Branch of the Multnomah County Library, near where she lived when she was young, has a map of Henry, Beezus, and Ramona’s Klickitat Street neighborhood hanging in its lobby. map The map shows the real-life locations of many special landmarks mentioned in Beverly’s books, including Ramona’s house, Henry’s paper route, Beezus and Ramona’s school, Ellen Tebbits’s house, the church Ramona performed a Christmas play at in Ramona and Her Father, and the store where Ramona got her bridesmaid’s dress for her Aunt Bea’s wedding in Ramona Forever. 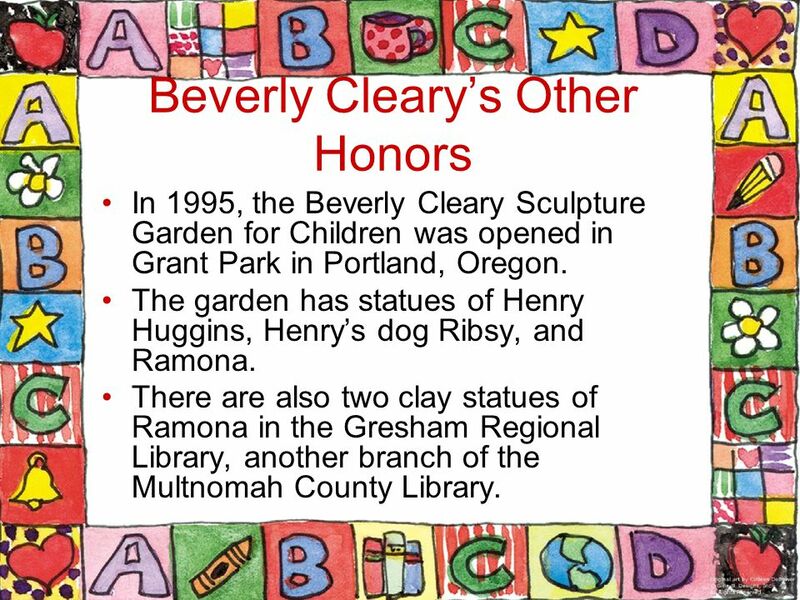 24 Beverly Cleary’s Other Honors In 1995, the Beverly Cleary Sculpture Garden for Children was opened in Grant Park in Portland, Oregon. The garden has statues of Henry Huggins, Henry’s dog Ribsy, and Ramona. 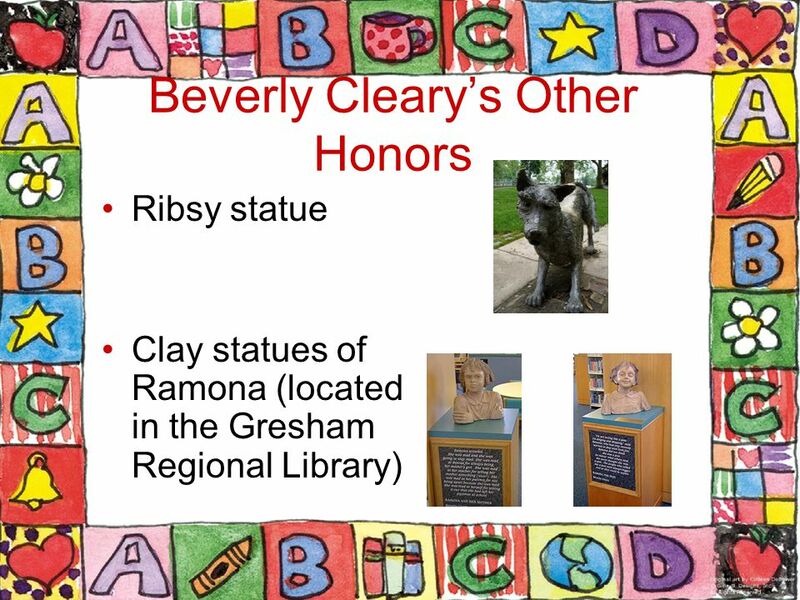 There are also two clay statues of Ramona in the Gresham Regional Library, another branch of the Multnomah County Library. 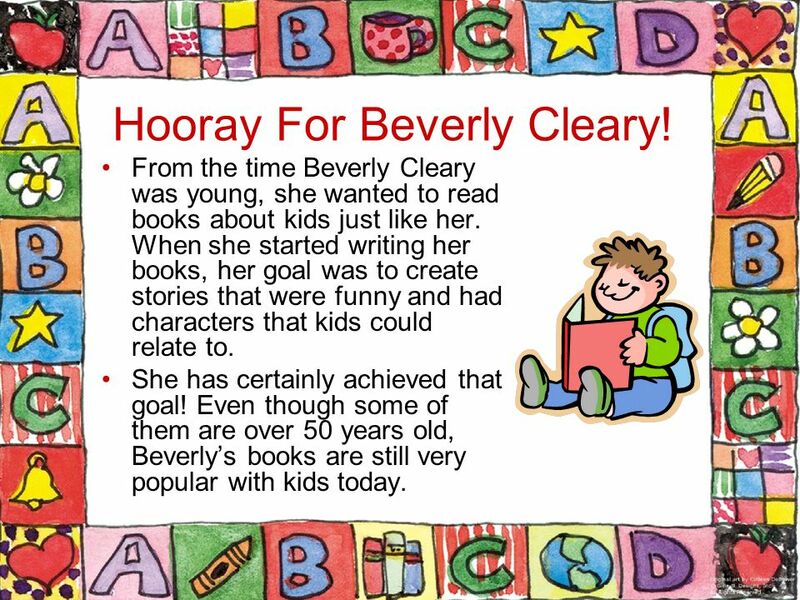 27 Hooray For Beverly Cleary! From the time Beverly Cleary was young, she wanted to read books about kids just like her. When she started writing her books, her goal was to create stories that were funny and had characters that kids could relate to. She has certainly achieved that goal! 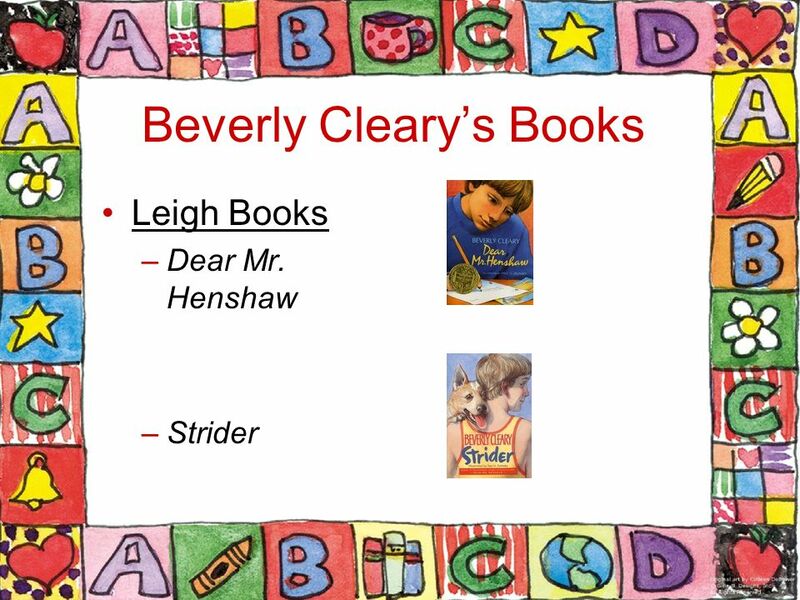 Even though some of them are over 50 years old, Beverly’s books are still very popular with kids today. 28 Let’s Talk! 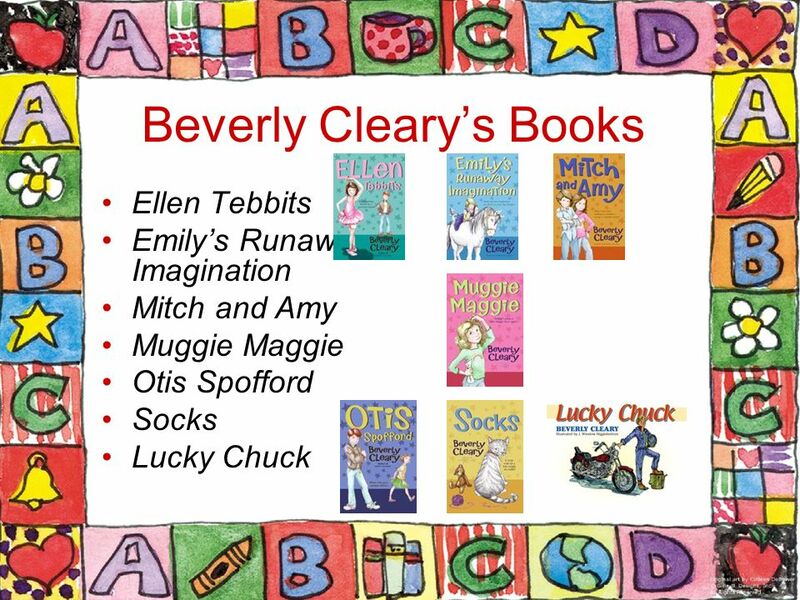 What Beverly Cleary books have you read? Would you recommend them to a friend? Why have her books been so popular, both today and when they were first written? When you think about what happened to her in first grade, why is it surprising that she became an author? 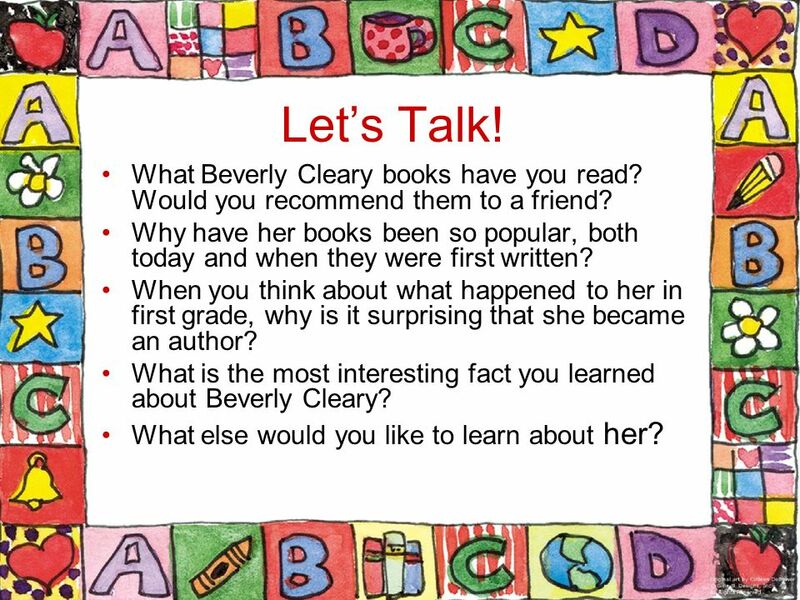 What is the most interesting fact you learned about Beverly Cleary? What else would you like to learn about her? 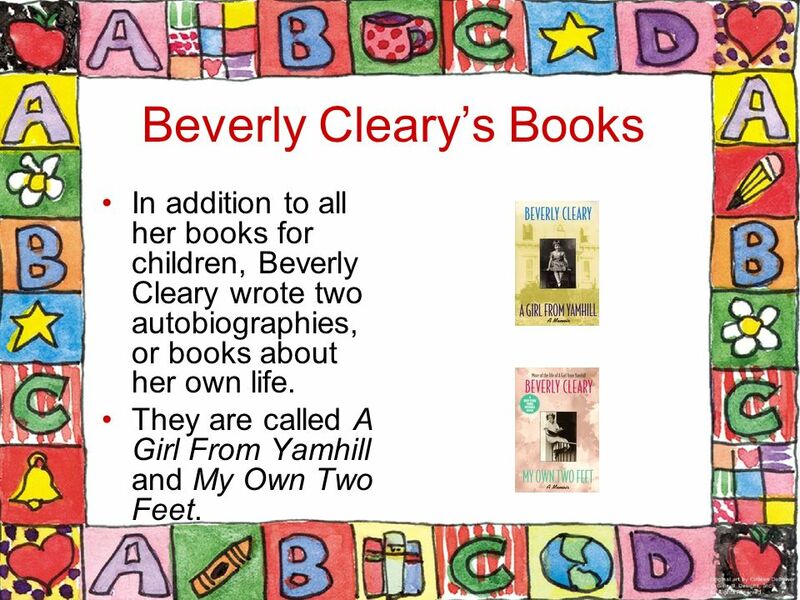 29 More About Beverly Cleary To learn more, you can visit Beverly Cleary's Official Website. 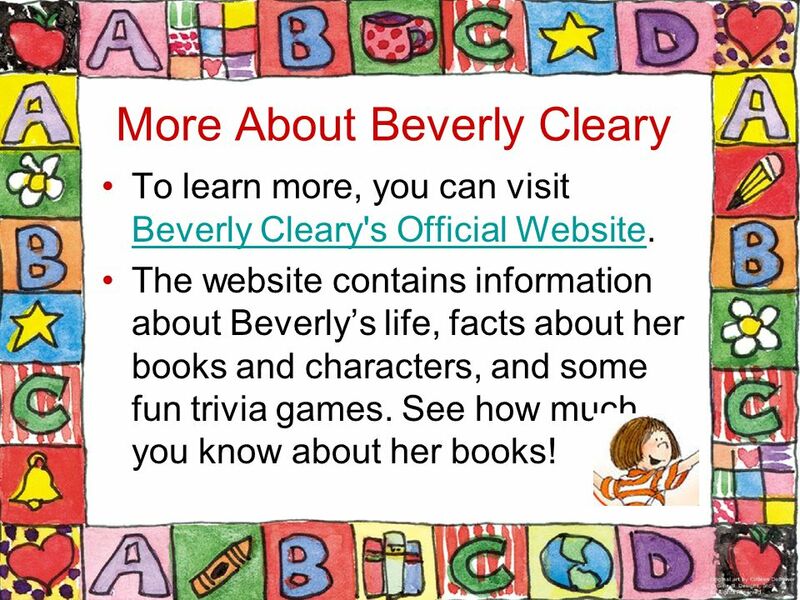 Beverly Cleary's Official Website The website contains information about Beverly’s life, facts about her books and characters, and some fun trivia games. See how much you know about her books! 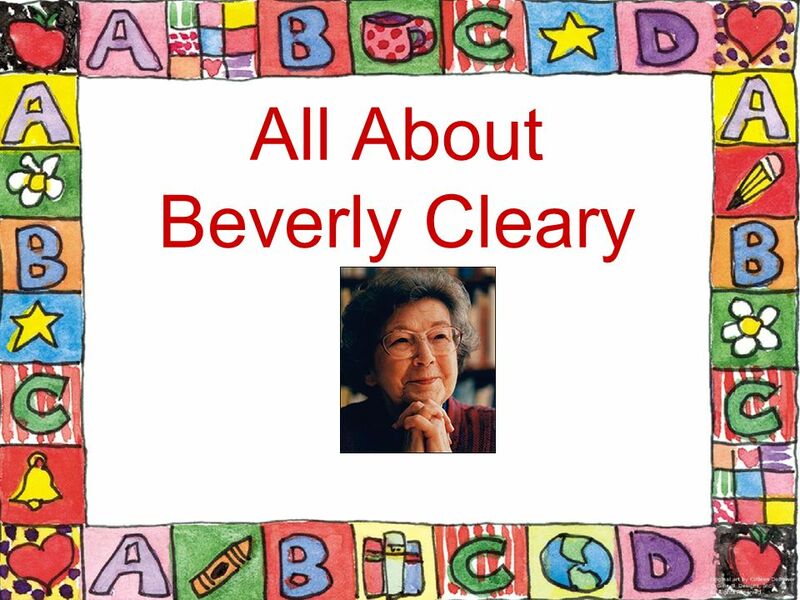 Download ppt "All About Beverly Cleary. 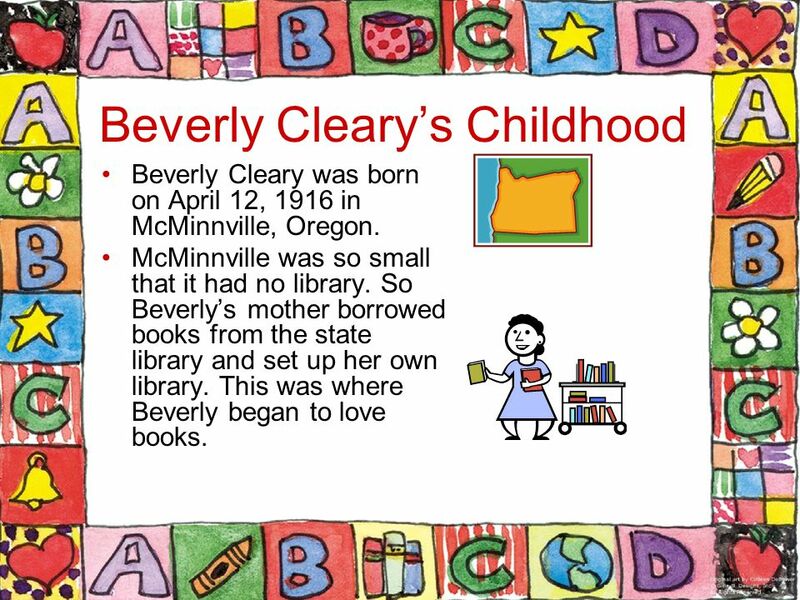 Beverly Cleary’s Childhood Beverly Cleary was born on April 12, 1916 in McMinnville, Oregon. McMinnville was so small that it." 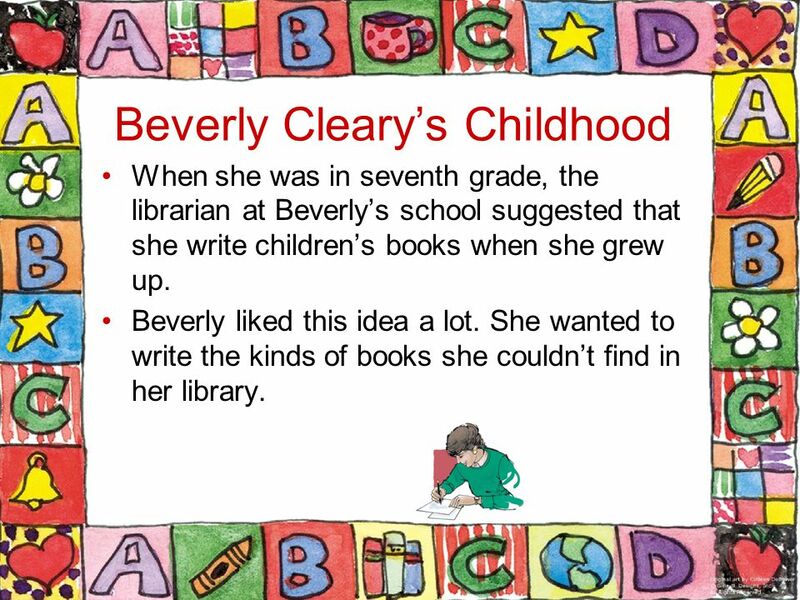 BEVERLY CLEARY BELOVED AUTHOR. BEVERLY CLEARY Here is a picture of Beverly when she was a young woman. What do you call it when the same characters are in different stories? What was the Series we studied last week? Who was the author? What do you need. Beverly Cleary and Ramona A Book Study Unit. 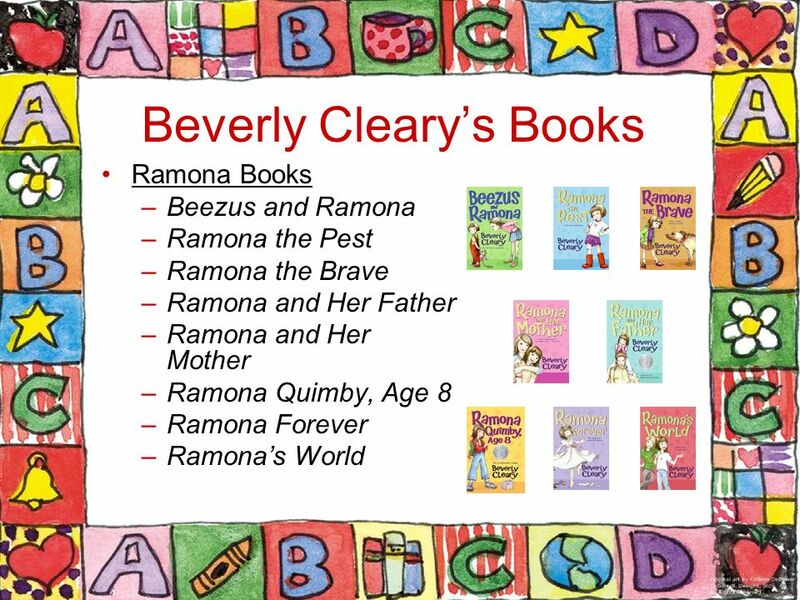 The World of Ramona The focus of the book study will be on Beverly Clearys Ramona series. In groups you will. April’s Story April’s Story Growing up in the educational system as a multiracial child. Jackie Gilliam English III/ 2 nd period Mrs. Lassiter’s Class. Beverly Cleary’s own story is as lively and irresistible as any of her novels. She was born Beverly Bunn in McMinnville, Oregon, and, until she was old. 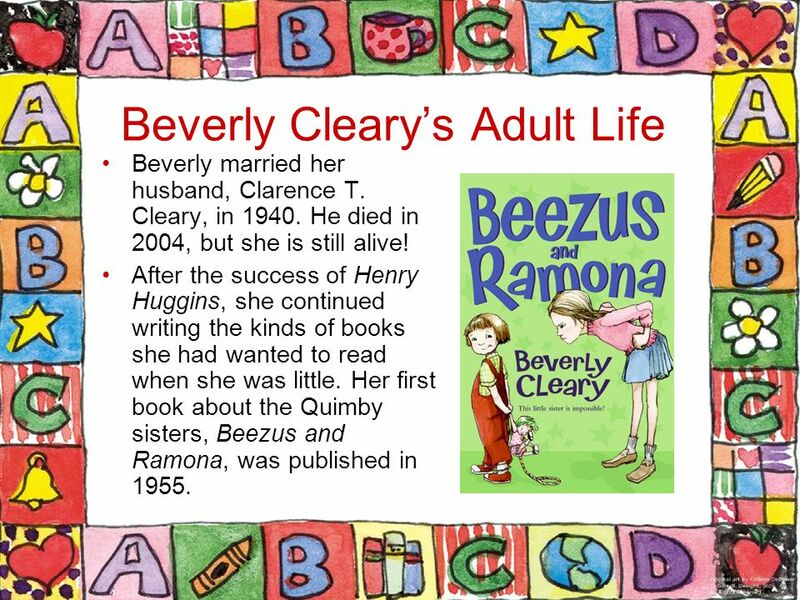 BEEZUS AND RAMONA BY: BEVERLY CLEARY GIANNA SHRAGA Other Books By Beverly Cleary: Ramona’s World Henry and Beezus Ramona Forever Ramona Quimby Age 8 Ramona. Laura Ingalls Wilder Literacy Award Medal Photo Images originated from the U.S. National Archive & Records Administration & are used in this project for. Meet Kevin Henkes. Kevin Henkes Here is Wisconsin. Kevin Henkes was born on November He grew up in Wisconsin, where he still lives today. 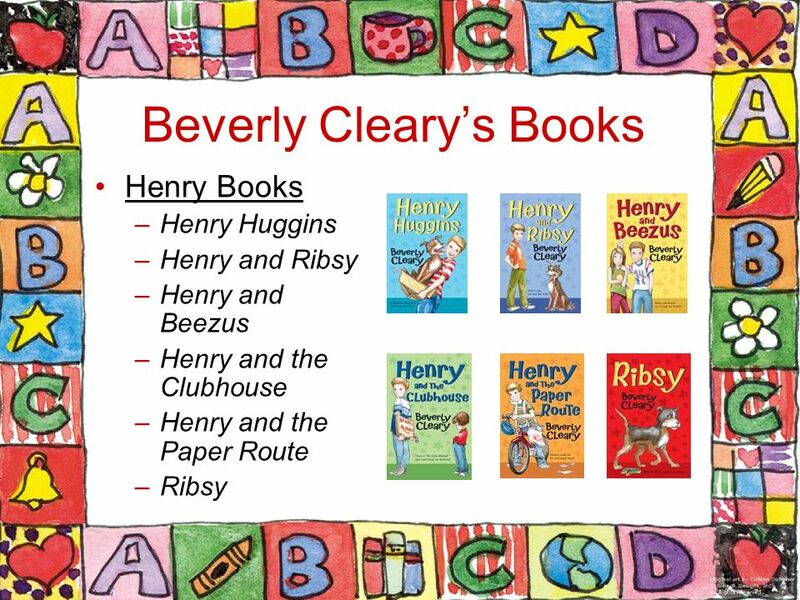 Henry And Beezus By Beverly Cleary Other books by Beverly Cleary Ramona and Her Father Ribsy Dear Mr. Henshaw Ralph S. Mouse Runaway Ralph. Beezus and Ramona Kailee Bly’s Recommendation. Beezus and Ramona  Written by Beverly Cleary  Illustrated by Tracy Dockray  Published by Scholastic. The Giver By Lois Lowry. Can you judge a book by its cover? Prepared by: Kathryn A. Walker.  Born in McMinnville, Oregon  Lived in town so small, no library  Family moved to Portland, Oregon where Beverly attended. Ramona Quimby, Age 8 by Beverly Cleary Background Information.